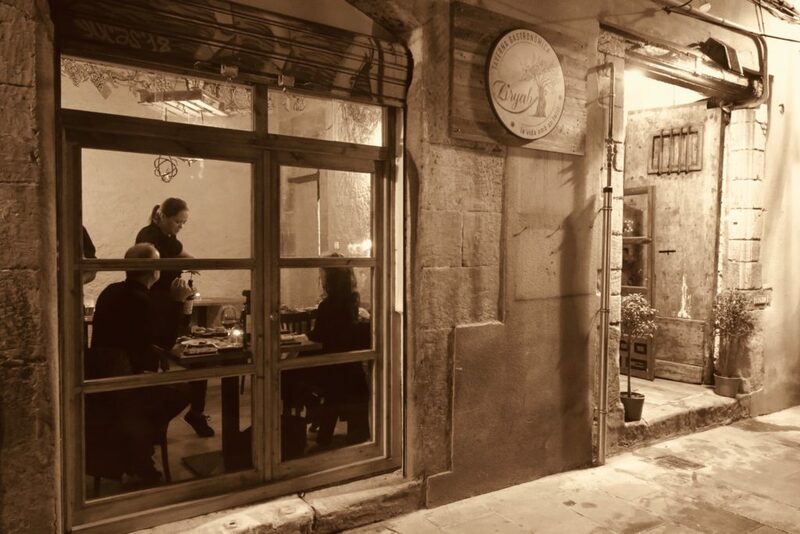 Ziryab is a cute little fusion tapas restaurant in the backstreets of Barcelona’s old medieval town. It sits hidden in a winding alleyway near the Picasso Museum on carrer de Montcada, the street that from the 17th century onwards was used for the rich merchants and noblemen of Barcelona to build their palaces, which were expansive, charming with welcoming inner courtyards and housed horse stables, servants quarters and rooms for entertaining visitors… these old palaces have now been converted into museums and galleries, and Ziryab is right round the corner. 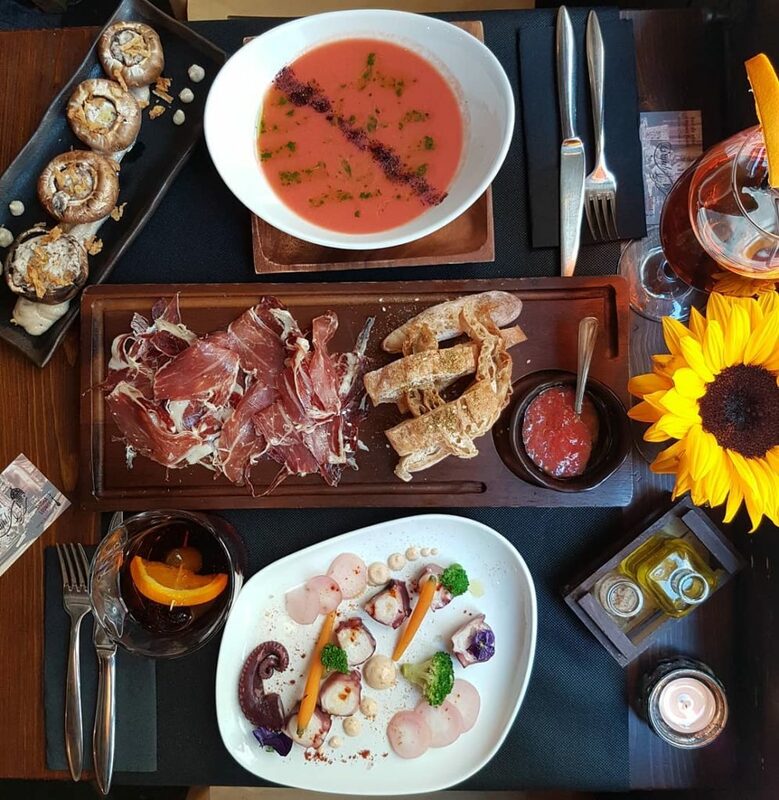 Ziryab’s tapas restaurant itself evokes the charm of this part of the old city with its brick walls, its low wooden beamed ceilings and typical Catalan inner mezzanine balcony overlooking the bar area. Apart from our dynamic wine list, with a selection of wines – some quite rare, some quite quirky, many beautifully affordable – from all over Catalonia as well as great wines from the rest of the Mediterranean, Ziryab serves super tasty tapas, all made fresh and in-house, using quality ingredients and blending traditional local tapas with Mediterranean flavours to create interesting, spicy and flavoursome dishes, healthier and lighter than the regular deep-fried tapas you often find in Barcelona’s many eateries. Ziryab’s pa amb tomàquet (a typical local tapa of bread smeared with garlic and tomato) is served on traditional pa de vidre bread, and comes with extra virgin olive oil from a Catalan cooperative, and zaatar thyme spice mix from Lebanon. Its patatas bravas are oven-baked in rosemary and garlic, and other dishes like grilled halloumi cheese and jamón serrano, the fine local cured ham, or Jordanian medjoul dates wrapped in bacon leave the customer salivating for more! The idea is to have a selection of dishes cover your table with the sights and colours of these dishes, and share the wonderful flavours between your group. Our team is always ready to welcome guests, explain different ingredients on the menu and recommend a wine or other drink to go with your meal. Tapas in Barcelona comes aplenty, but tapas in Barcelona coupled with ambience, recommendations and a unique flavoursome menu is less readily found. The atmosphere is always homely at Ziryab, with a light background musical playlist that includes jazz numbers, bossa nova, swing…. and Ziryab also holds a number of events, where the atmosphere is great and people are meet-worthy. Ziryab also organises wine tastings and caters for group bookings. There are always different events happening for different occasions.